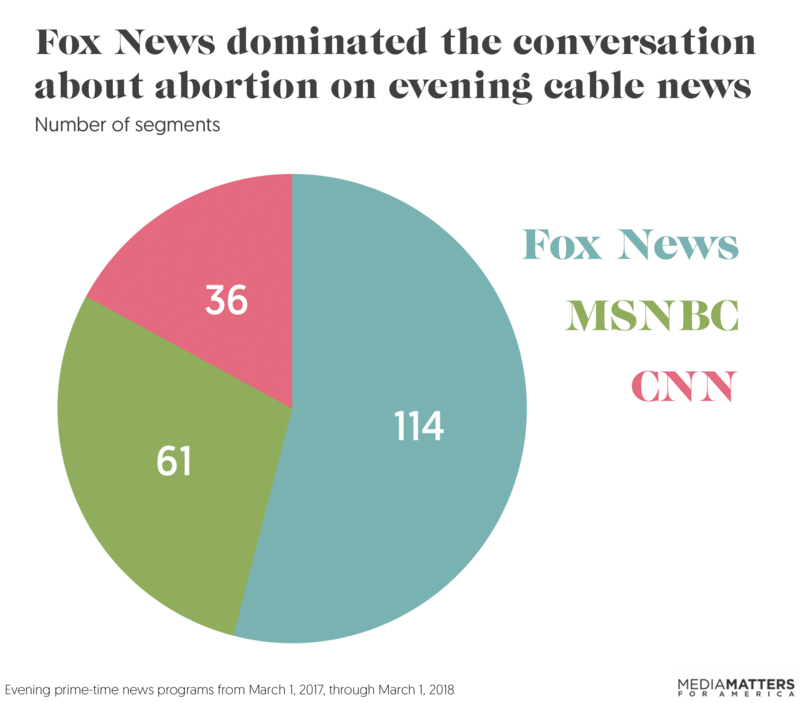 Media Matters analyzed evening cable news programs on Fox News, CNN, and MSNBC from March 1, 2017, through March 1, 2018, looking for segments that included a substantial conversation about abortion or reproductive rights. The resulting 211 segments were then coded for mention of one or more of three general topics of conversation: abortion in relation to political party platforms, abortion in relation to legal issues, and abortion in relation to religion. Fox News was responsible for 54 percent of all segments about abortion. Out of the 211 total segments identified during this study, Fox News alone was responsible for 114 segments -- 54 percent of all coverage. MSNBC had the second most segments about abortion, with 61 (29 percent of all segments), while CNN covered abortion-related topics the least, adding 36 segments (17 percent of all segments). 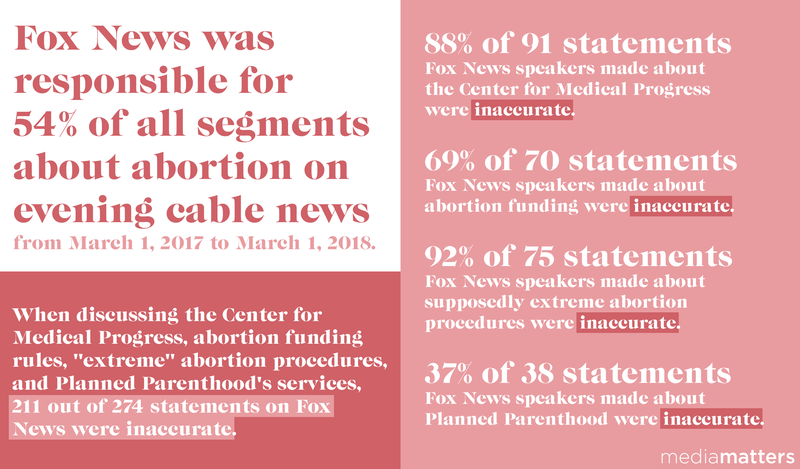 Although statements made on all networks trended toward inaccuracy, Fox News programs contained the most misinformation about abortion. Media Matters identified 379 total statements about four abortion-related topics: the Center for Medical Progress (CMP), abortion funding rules, Planned Parenthood’s essential services, and “extreme” abortion procedures. Of these 379 statements, 239 contained misinformation (63 percent). Speakers appearing on Fox News were responsible for 274 of these statements, 211 of which were inaccurate (77 percent). In comparison, speakers on MSNBC were responsible for 57 statements, 12 of which contained misinformation (21 percent), while CNN contributed only 48, 16 of which were inaccurate (33 percent). Evening cable news coverage of abortion was often framed around litigation or religion. Media Matters coded segments about abortion in terms of whether they revolved around political party stances, courts or litigation, or religion. Most often, segments were framed around court battles related to abortion, or abortion as a matter of religion or faith. Each of these two frames was used in 23 percent of all segments, or about half (46 percent) of all the segments that included a substantial conversation about abortion. Fox News framed abortion coverage in terms of religion most of all three networks. While Fox News and MSNBC each discussed abortion in relation to religion or faith in 25 percent of its segments about abortion, Fox News had a greater total number of segments framed this way -- 28 compared to MSNBC’s 15. CNN discussed abortion as a matter of faith in six segments. In conversations about political litmus tests on abortion, the focus was primarily on the Democratic Party platform. The second most common framing for segments about abortion was in relation to political party positions or litmus tests, with 26 total segments framed this way. Notably, discussion of the Democratic Party’s position on abortion was dominant. Of the 26 total segments discussing either party’s stance, 20 were focused on Democrats (77 percent) compared to three segments that exclusively focused on the Republican Party platform (12 percent). Media Matters looked at four common topics related to abortion -- about the Center for Medical Progress, funding rules, Planned Parenthood as an essential health care provider, and so-called “extreme” procedures. 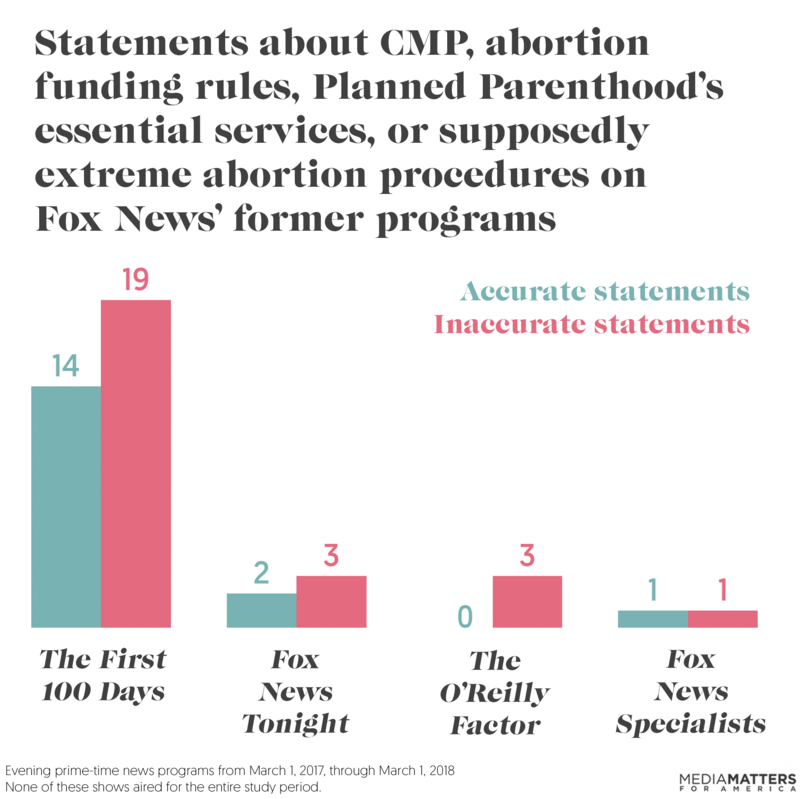 Fox News was the only network to talk about CMP’s discredited smear campaign against Planned Parenthood. Fox News was responsible for airing a great deal of misinformation about the four abortion-related topics, and it was notably the only network in our study to make statements about CMP and its discredited videos purporting to show that Planned Parenthood had engaged in the sale of fetal body parts. Speakers on Fox News made 91 total statements about CMP, 80 of which contained misinformation (88 percent). Speakers on Tucker Carlson Tonight discussed four abortion-related topics the most on Fox News -- and they were wrong 80 percent of the time. Of Fox News’ 274 total statements containing information about CMP, abortion funding rules, Planned Parenthood’s essential services, or supposedly "extreme" abortion procedures, speakers on Tucker Carlson Tonight made 141, meaning that 51 percent of Fox News’ statements about abortion occurred during this program. Notably, of the 141 statements made during Tucker Carlson Tonight, 113 contained misinformation (80 percent). 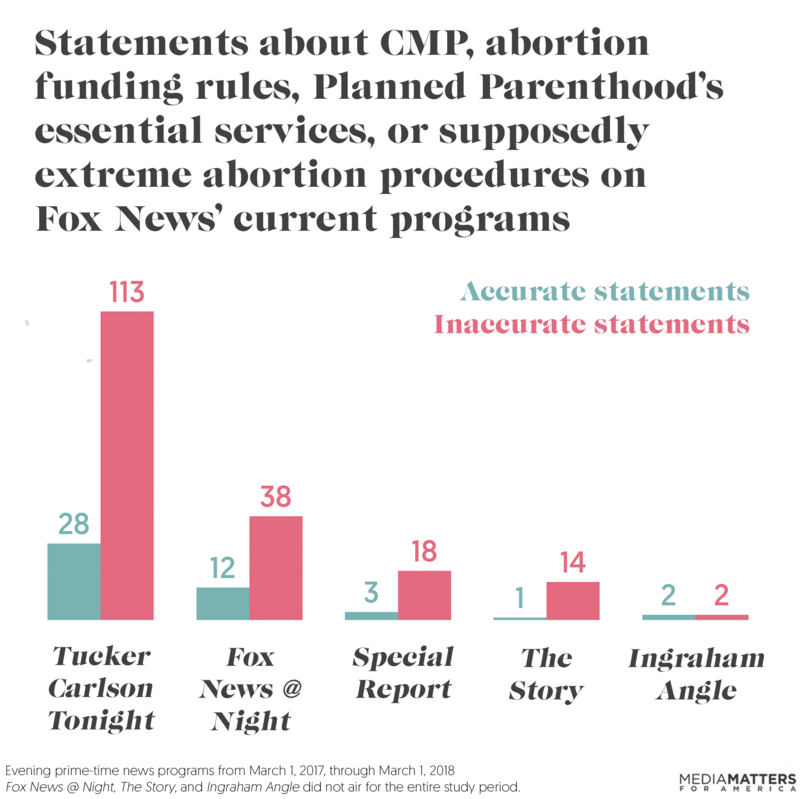 Notably, speakers on Tucker Carlson Tonight made almost exclusively inaccurate statements about CMP and allegedly “extreme” abortion positions. In addition to making the most statements overall, speakers appearing on Tucker Carlson Tonight made 56 total statements about CMP, 55 of which were inaccurate (98 percent). Similarly, speakers made 33 total statements about allegedly “extreme” abortion positions, 31 of which contained misinformation (94 percent). Speakers appearing on Fox News @ Night made the second highest number of statements about the four abortion-related topics on Fox News. Of the 274 total statements made on Fox News about the four abortion-related topics, the second highest number occurred during Fox News @ Night. Speakers on this program made 50 such statements, 38 of which contained misinformation (76 percent). Fox News @ Night was responsible for highly inaccurate information about supposedly “extreme” abortion procedures and CMP. Speakers appearing on Fox News @ Night made a number of inaccurate statements about both CMP and allegedly “extreme” abortion procedures. For example, of the 12 total statements made about CMP, eight were inaccurate (67 percent). Similarly, 20 of the 23 statements made about allegedly “extreme” abortion procedures contained misinformation (87 percent). Of the 21 statements made by speakers appearing on Special Report, 18 contained misinformation, making it 86 percent inaccurate. Although speakers appearing on Special Report did not make as many statements as speakers on Tucker Carlson Tonight or Fox News @ Night did, they still contributed 21 total statements about the abortion-related topics to the network’s total. Of these 21 statements, 18 contained misinformation (86 percent). Of note, all nine of the statements made about abortion funding rules and allegedly "extreme" abortion procedures were inaccurate (100 percent). A majority of the statements made during The Story contained misinformation. Viewers of the Fox News program The Story received information about the four abortion-related topics that was almost entirely inaccurate. Of the 15 total statements about these topics made during the show, 14 were inaccurate (93 percent). Notably, 100 percent of the program’s statements about both CMP and supposedly “extreme” abortion procedures were inaccurate. Half of the statements made during The Ingraham Angle contained misinformation. Fox News’ The Ingraham Angle started in the midst of the study’s time frame, airing for the first time on October 30, 2017. Speakers on the program contributed four statements to the network’s total, two of which were inaccurate (50 percent). Speakers appearing during The First 100 Days made statements about the four abortion-related topics that were inaccurate 58 percent of the time. Although The First 100 Days stopped airing in April 2017, the program was responsible for 33 total statements about the four abortion-related topics during the study time frame. Of these 33 statements, 19 contained misinformation (58 percent). Of note, speakers appearing on The First 100 Days made predominantly inaccurate statements about Planned Parenthood’s essential services, with 10 of the 16 total statements on this topic containing misinformation (63 percent). Speakers appearing on Fox News Tonight made five statements about the four abortion-related topics, almost all of which were inaccurate A short-running program in the shifting Fox News lineup, Fox News Tonight still included three segments involving a substantial discussion of abortion. During these three segments, speakers appearing on Fox New Tonight made five statements about the four abortion-related topics, three of which were inaccurate (60 percent). Before it was canceled, The O’Reilly Factor managed to air entirely inaccurate statements. Speakers appearing on The O’Reilly Factor made three statements about any of the four abortion-related topics before the program stopped airing in April 2017. Notably, all three of these statements were about CMP and all three contained misinformation (100 percent). During the short-running program Fox News Specialists, speakers made only two statements about the four abortion-related topics. Fox News Specialists ran for only a few months of the study time frame, and speakers appearing on the program made two statements pertinent to the four abortion-related topics. One was accurate and the other was inaccurate (50 percent each). The one inaccurate statement was about abortion funding rules. MSNBC had the second most statements about the four abortion-related topics, with 57 total, only 21 percent of which were inaccurate. 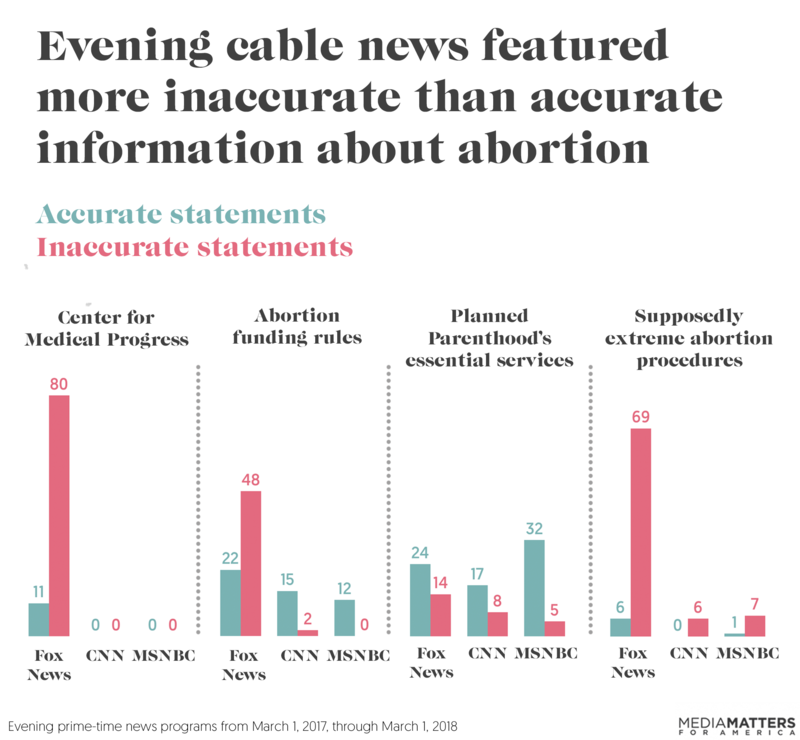 Of the 379 statements made about the four abortion-related topics across the three networks during the study time frame, MSNBC had the second most overall, with 57 total statements (15 percent). In comparison, Fox News had 274 statements, while CNN had 48. Media Matters determined that only 21 percent of MSNBC’s statements (12 of 57) contained inaccurate information about CMP, abortion funding rules, Planned Parenthood’s essential services, or allegedly “extreme” abortion procedures -- making MSNBC the network that aired the lowest percent of inaccurate information about these four topics. MSNBC’s statements about allegedly “extreme” abortion procedures were mostly inaccurate. Although MSNBC aired the least amount of misinformation (21 percent) about the four abortion-related topics Media Matters examined among the cable networks, it is notable that the network’s statements about allegedly “extreme” abortion procedures were almost entirely inaccurate. Of the eight total statements made about allegedly “extreme” abortion procedures, seven were inaccurate (88 percent). MSNBC’s statements about abortion funding rules were entirely accurate. Within the segments coded by Media Matters, all statements made by the hosts, correspondents, and guests on MSNBC about abortion funding rules were accurate. Of 12 total statements on the topic, all 12 (100 percent) accurately described rules prohibiting the use of federal dollars for abortion or debunked the myth that Planned Parenthood uses taxpayer dollars for abortion. Hardball was responsible for the second highest number of statements about the four abortion-related topics on MSNBC, with 11 total. Second only to the no-longer-airing For the Record, Hardball was the MSNBC program with the second highest number of statements about CMP, abortion funding rules, Planned Parenthood’s essential services, or allegedly “extreme” abortion procedures, contributing 11 of the network’s total 57 (19 percent). Of these 11 statements, only four contained inaccurate information about the four topics in question (36 percent). All of the inaccurate statements made on Hardball about the four abortion-related topics were about supposedly “extreme” abortion procedures. All four of the inaccurate abortion-related statements made during Hardball were about allegedly “extreme” abortion procedures (100 percent). Of these four statements, two were made by host Chris Matthews. The Beat was responsible for nine of MSNBC’s 57 total statements about the four abortion-related topics, and none of these statements were inaccurate. Although The Beat began airing only partway through the time frame that Media Matters studied, the program was responsible for nine of the network’s 57 total statements about the four abortion-related topics (16 percent). Notably, all of these statements about CMP, abortion funding rules, Planned Parenthood’s essential services, or allegedly “extreme” abortion procedures contained accurate information (100 percent). The Last Word was also responsible for nine of MSNBC’s 57 total statements about the four abortion-related topics, and none of them was inaccurate. Notably, although The Last Word ran for the entirety for the time period studied by Media Matters, the program was responsible for the same number of total statements as The Beat, which ran for only part of the time period. Media Matters found nine total statements about CMP, abortion funding rules, Planned Parenthood’s essential services, or allegedly “extreme” abortion procedures on The Last Word -- representing 16 percent of MSNBC’s 57 total statements. All nine of these statements were accurate (100 percent). The Last Word aired entirely accurate information about Planned Parenthood’s essential services. Of the nine statements about the four abortion-related topics made on The Last Word, all were about Planned Parenthood’s role as an essential service provider or the specific services the organization provides and all nine were accurate. MTP Daily was responsible for four of MSNBC’s 57 total statements about the four abortion-related topics, and three contained inaccurate information. 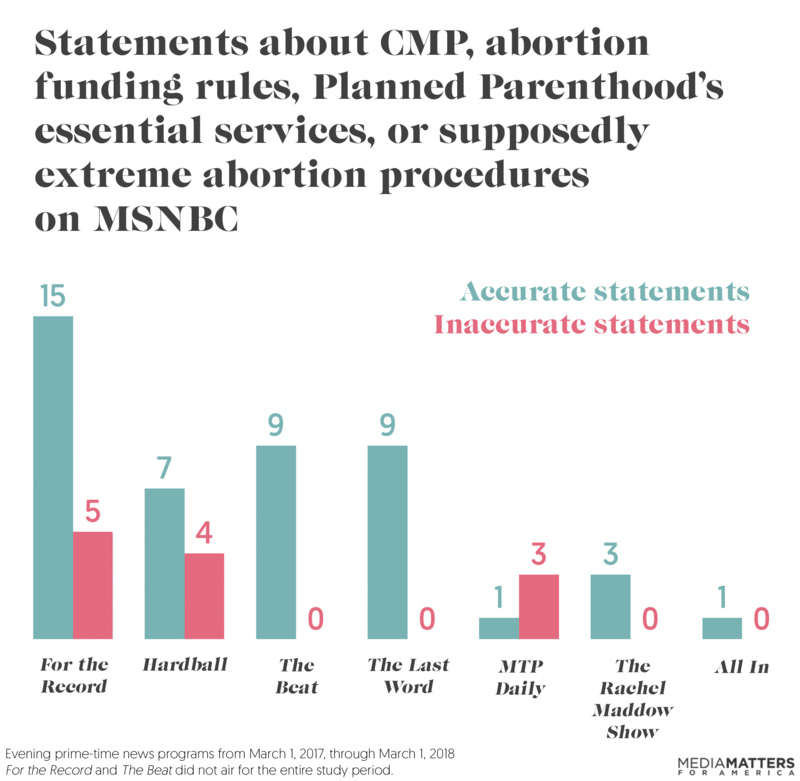 Four of MSNBC’s 57 total statements about CMP, abortion funding rules, Planned Parenthood’s essential services, or allegedly “extreme” abortion procedures were made on MTP Daily (7 percent). Notably, three of the four were inaccurate (75 percent). All of MTP Daily’s three inaccurate statements involved misinformation about allegedly “extreme” abortion procedures. Notably, all four of the statements on MTP Daily about the four abortion-related topics were about allegedly “extreme” abortion procedures and three contained misinformation (75 percent). Only three of MSNBC’s 57 statements about the four abortion-related topics occurred during The Rachel Maddow Show. Of MSNBC’s 57 total statements about CMP, abortion funding rules, Planned Parenthood’s essential services, or allegedly “extreme” abortion procedures, The Rachel Maddow Show was responsible for only three statements (5 percent). Notably, all three of these statements contained accurate information (100 percent) about at least one of the four abortion-related topics. All In was responsible for only one of MSNBC’s 57 statements on the four abortion-related topics. Although All In ran for the entirety of the time period surveyed by Media Matters, the program was responsible for only one of MSNBC’s 57 total statements about CMP, abortion funding rules, Planned Parenthood’s essential services, or allegedly “extreme” abortion procedures (2 percent). Notably, this one statement was an accurate (100 percent) description of rules prohibiting the use of federal funding for abortion. The majority of MSNBC’s statements about the four abortion-related topics occurred during the now-canceled program For the Record. Twenty of the 57 statements about the four abortion-related topics made during MSNBC programming occurred during the now-canceled program For the Record (35 percent). Also of note, For the Record’s 20 statements occurred during only two segments, the fewest of all MSNBC programs. Of For the Record’s 20 statements, only five were inaccurate. For the Record’s 20 statements about the four abortion-related topics were largely accurate. Of the 20 statements, only five contained misinformation about CMP, abortion funding rules, Planned Parenthood’s essential services, or allegedly “extreme” abortion procedures (25 percent). CNN had the fewest statements about the four abortion-related topics, with only 48 statements out of 379 total across all networks. Out of the 379 statements made about the four abortion-related topics on the three networks, CNN had the fewest, with only 48 statements (13 percent). Notably, of these 48 statements, 16 contained misinformation about CMP, abortion funding rules, Planned Parenthood’s essential services, or allegedly “extreme” abortion procedures (33 percent). CNN’s statements about allegedly “extreme” abortion procedures were entirely inaccurate. Although CNN aired the fewest statements about the four abortion-related topics, the entirety of the network’s statements about allegedly “extreme” abortion procedures were inaccurate. Of the six statements about this topic, all six contained misinformation or promoted anti-choice myths (100 percent). The majority of CNN’s statements about the four abortion-related topics occurred during Anderson Cooper 360. Out of the 48 total statements made on CNN about CMP, abortion funding rules, Planned Parenthood’s essential services, or allegedly “extreme” abortion procedures, 35 occurred during appearances on Anderson Cooper 360 (73 percent). Of these 35 statements, 12 contained misinformation about one of the four abortion-related topics (34 percent). All of the statements about allegedly “extreme” abortion procedures on Anderson Cooper 360 contained anti-choice misinformation. Of the 35 total statements on Anderson Cooper 360, four involved discussion of allegedly “extreme” abortion procedures. All four of these statements were inaccurate (100 percent). A majority of the statements about abortion funding on Anderson Cooper 360 were accurate. In comparison, there were 14 total statements made about abortion funding rules on Anderson Cooper 360. Of these 14 statements, 12 included accurate information about the prohibition on using federal funds for abortion care, while two contained misinformation (14 percent). Erin Burnett OutFront was responsible for nine of CNN’s 48 statements, and they were inaccurate 22 percent of the time. 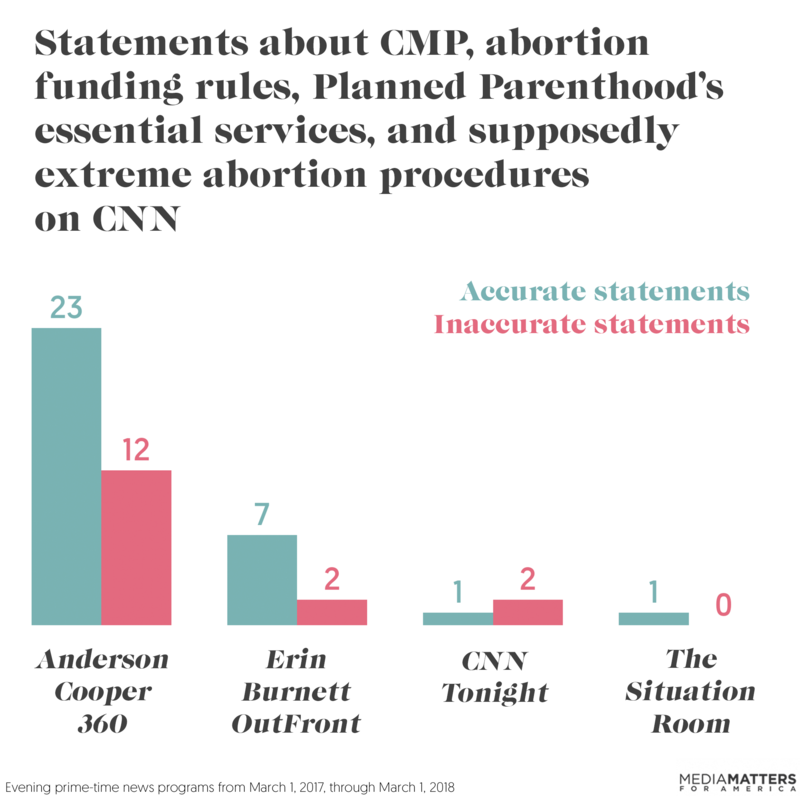 Of the 48 statements on CNN about CMP, abortion funding rules, Planned Parenthood’s essential services, or allegedly “extreme” abortion procedures, nine occurred during appearances on Erin Burnett OutFront (19 percent). Of these nine statements, two contained misinformation (22 percent). All of the statements on Erin Burnett OutFront about allegedly “extreme” abortion procedures were inaccurate. Of the nine total statements made during appearances on Erin Burnett OutFront about the four abortion-related topics, the two statements made about allegedly “extreme” abortion procedures contained misinformation (100 percent). Erin Burnett OutFront contained only accurate statements about abortion funding rules and Planned Parenthood’s essential services. The three statements on Erin Burnett OutFront about abortion funding rules and four about Planned Parenthood’s essential services were all accurate. CNN Tonight was responsible for only three of CNN’s 48 total statements, and these statements were largely inaccurate. Although CNN Tonight was responsible for only three of CNN’s 48 total statements (6 percent) about CMP, abortion funding rules, Planned Parenthood’s essential services, or allegedly “extreme” abortion procedures, a majority of these statements -- two (67 percent) -- were inaccurate. All of CNN Tonight’s statements were about Planned Parenthood’s essential services, and they were mostly inaccurate. All three of the statements made during CNN Tonight concerned Planned Parenthood and its essential services. Two of these three statements contained misinformation (67 percent). The Situation Room was responsible for only one statement about any of the four abortion-related topics. The Situation Room was responsible for only one of CNN’s 48 statements about CMP, abortion funding rules, Planned Parenthood’s essential services, or allegedly “extreme” abortion procedures (2 percent). This statement was an accurate one about Planned Parenthood’s essential services. Media Matters conducted a Nexis search of transcripts for evening cable news programming from March 1, 2017, through March 1, 2018. The following programs were included: CNN’s The Situation Room with Wolf Blitzer, Erin Burnett OutFront, Anderson Cooper 360, Cuomo Prime Time, CNN Tonight with Don Lemon; MSNBC’s MTP Daily, For The Record with Greta Van Susteren*, The Beat with Ari Melber*, Hardball with Chris Matthews, All In with Chris Hayes, The Rachel Maddow Show, The Last Word with Lawrence O'Donnell, The 11th Hour with Brian Williams; Fox News’ The Fox News Specialists*, Special Report with Bret Baier, The First 100 Days*, The Story with Martha MacCallum*, Tucker Carlson Tonight, The O'Reilly Factor*, Hannity, The Ingraham Angle*, Fox News Tonight*, and Fox News @ Night*. Due to the substantial reorganization of programming at both Fox News and MSNBC during the study period, programs that were either added or removed from the networks during its time frame are marked with an asterisk above. Fox News’ The Five -- which moved time slots twice during the study period -- is excluded from these results due to the structure of the program and the lack of guest and correspondent appearances. Cuomo Prime Time and The 11th Hour with Brian Williams yielded zero results. For this study, Media Matters included only those segments where the stated topic of conversation was abortion or reproductive rights, or where “substantial discussion” of these topics occurred. We defined “substantial discussion” as that in which two or more speakers had at least one direct exchange on the topic. Host monologues were included when the speaker made two independent mentions of abortion or reproductive rights within the same segment. We did not include statements made in news or video clips in edited news packages except those made by a network correspondent. If news packages aired more than once, we coded only the first unique appearance. The resulting 211 segments were then coded for mention of one or more of three general topics of conversation: abortion in relation to political party platforms, legal issues, and religion. Segments were also coded for the number of accurate or inaccurate statements each speaker made about four abortion-related topics: the Center for Medical Progress (CMP), abortion funding rules, Planned Parenthood’s essential services, and allegedly “extreme” positions about abortion. Charts and graphics by Sarah Wasko.